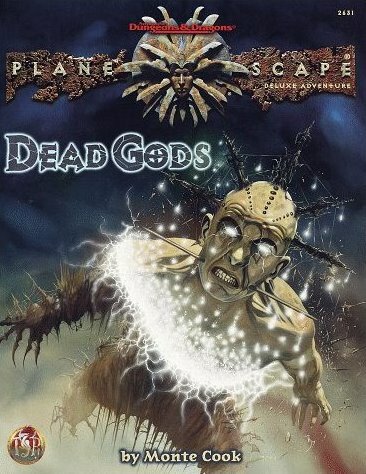 Dead Gods is written by Monte Cook, one of Planescape's major designers. A lot of thought went into this and it really shows. Most of this will cover the "Out of the Darkness" campaign, as "Into the Light" is only a small portion of the book. Dead Gods is a sequel to the well-done "Great Modron March" adventure anthology. A DM doesn't have to run The Great Modron March, and actually has to know nothing of it as all the info is presented to them in the DM section. Still, taking your players through The Great Modron March and then into Dead Gods will answer a lot of hanging questions and be more rewarding to the players. The basic plot of "Out of the Darkness" is that a dead god has come back to life and is wreaking havok across the Planes in trying to get back his lost power. Who is the dead god? Why, it's none other than Orcus, of classic D&D fame. He's out in search of his wand, which holds a good portion of his power and he'll do anything to get it. It IS an amazing adventure! I had the occasion of playing a gazillion years ago and still the memory brings a smile to my face. l'une des plus incroyables campagne pour d&d! no way, the greatest campaign, the better planescape adventures! that's the epitomize of all the planescape adventures! great campaign with bad bad bad foes!